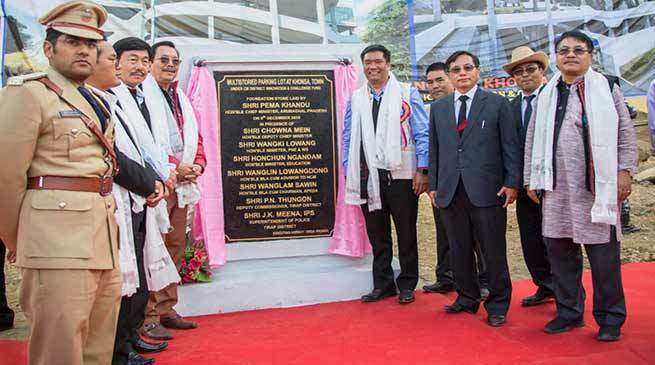 CM Pema Khandu reached Khonsa during is Arunachal Rising his campaign, laid foundation stone of multistory parking lot. Chief Minister Pema Khandu launched the Arunachal Rising campaign at Katang today in presence of DCM Chowna Mein, PHE&WS Minister Wangki Lowang, Advisor to CM Wanglin Lowangdong, MLA Wanglam Sawin and State BJP President Tapir Gao. Earlier he laid the foundation stone for multi-storied parking lot for Khonsa town to be constructed under CM district innovation & challenge fund. He also inaugurated the administrative circle headquarters for Bari-Basip circle, augmentation of water supply to Khonsa township under NLCPR and laid the foundation stone for Police Station at Katang. DCM also inaugurated the office of the Circle Officer at Katang. Speaking at a public function in Katang, Chief Minister assured to fill the manpower gap for the new administrative circle headquarters for Bari-Basip circle. He said the Bari-Basip administrative headquarters was first approved by former CM late Dorjee Khandu including the one for Borduria and Chubam. Informing that the state government will be bringing several reforms in the coming years, CM said in the initial period politicians may feel uncomfortable with the reforms but will prove to be in the interest of the people, which will have long-term benefit. During the occasion, Chief Minister released the 4-year of progress report of local MLA Wanglam Sawin and appreciated him for transparency and efficiency. Launching the Arunachal Rising campaing, Chief Minister gave away cash prizes and certificates to best ASHA workers, Anganwadi workers and progressive farmers from Bari-Basip circle. He also distributed blankets to gaon burahs of the circle. On the occasion DCM Chowna Mein, MLA Wanglam Sawin and State BJP President also spoke.